I had a job interview recently and I was asked to do FizzBuzz. The code is very simple to write, however I wanted to see if I could make it easily accept any series of numbers and easily alter its output. As you can see the last one is passing in a custom series and modifying the output to FizzBuzz. It uses several patterns, ReadOnly, Factory, Director, Builder and returns an iterable instance, just a coding exercise really. Here is a very simple script that once uploaded locks onto various architectures and extracts the database using the captured details. When nothing is detected it will still offer the manual entering of the username and password. 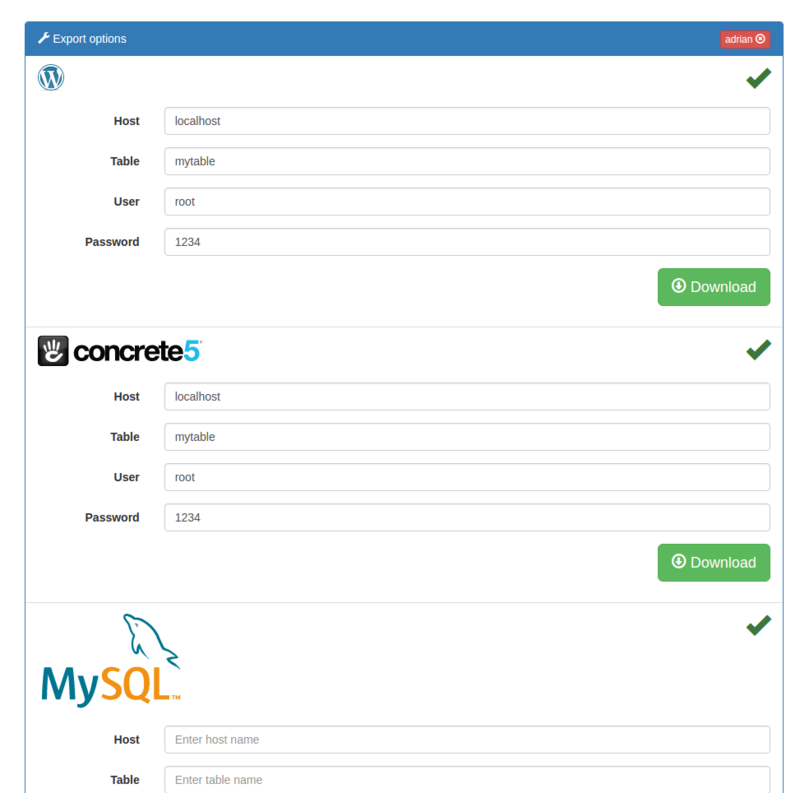 It currently supports Concrete5 and WordPress, but I can easily upgrade it to support many more like ZF1, ZF2, Magento, Drupal, Joomla, etc, if there is any interest. This is handy when you need to quickly copy a database, you simply upload this script to the doc_root and the script will attempt to handle the rest for you. The script comes with password protection to prevent unauthorised usage, or it will not just be you downloading the database. The script stores the username and password of those authorised to use it within the code, the password can be entered in plain text, or you can define your own algorithm and store the password encrypted in this way, within the code. The script can be downloaded from github here and the full source code is below. Are you sure you wish to logout '.$this->authentication->username.'? To create a nested menu in ZF2 you will need to tell the ZF2 navigation service to use a partial containing code that creates new markup. Here is a step by step example of how to output a nested menu in bootstraps markup in ZF2. To tell ZF2 navigation to use the partial myfile.phtml you simple append to the request setPartial and pass an array of arguments, the first argument contains the name of the partial file and the second the name of the module for example the first argument is ‘myfile.phtml’ and the second ‘default’ which is module Application. The partial will be used to render the navigation and this is where new logic to display the mark up should be contained. The following example code will create a nested menu, with the correct mark up and classes that bootstrap recognises, add this to the partial created above. The above code contains a simple function that loops through the pages checking if the current iteration has children or not. If the iteration does not, a page link is rendered with the correct classes for that level. If the iteration does contain children additional markup is created the function then makes a recursive call to itself to render those pages when the call returns it generates closing markup. When generating the markup the loop is aware of how deep within the menu structure it currently is. By being aware of the levels and positions CSS classes have been able to be applied at specific levels in addition to this extra markup such as carets has been injected into the top layer, indicating the presence of a drop down menu where present. This error can be caused by many things, but the most notable is when attempting to reuse DomPdf to render more than one PDF. This is to do with the way the service manager passes a single instance, and DOMPDF does not clean up after itself properly. Will fail, however despite the answer being very hard to find online the solution is rather simple, simply use the html renderer but request dompdf from the service manager, below I will render multiple PDF’s with different views, save them as files ready to be attached to an email. When including part of a theme using the wordpress function get_template_part(), you will notice the included template will not have access to any variables previously defined, this is because they are now out of scope. By using locate_template to generate a path and php’s include it is possible to include the template as though it was a block of code in line with the existing code thus consequently has access to the current scope. Both of which I am not keen on, the global fix (1) downside is that you will need to declare global on each and every variable you wish to use, and the use of global is bad. The second, Locate and include (2) downside is that should the template not exist a warning will be displayed, this is because a check before hand is not being performed, this leads to more code to check for the files existence or suppress the error, furthermore the code included has the potential to modify any variables in the existing scope. The function behaves in the same way as get_template_part() but performs all the correct checks before hand thus stopping any errors, then assigns the variables to the scope, includes the template, and finally returns a success of true or false. The internet often drops at work, so to compile a csv report of the outage time and for how long I wrote this script, which maybe of use to someone. echo "Logging connectivity of http://$resource/ to $outfile.csv CTRL+C to exit"
wget -q --tries=1 --timeout=10 --spider "http://$resource/"
echo "$count,$time,Up after being down for $(($duration / 60)) minutes and $(($duration % 60)) seconds" >> "$outfile.csv"
echo "$count,$time,Down after being up for $(($duration / 60)) minutes and $(($duration % 60)) seconds" >> "$outfile.csv"
A cluttered desktop can be a problem, typically people use the desktop becuase they know the location of the files should they have downloaded them from somewhere, and need to reuse them quickly. I have written a script that runs on Linux that cleans the desktop up on a daily basis, by moving all the files into a folder with an easily readable date name within an archive folder, so that your desktop remains clean and ordered, and you also do not lose your files. Just run the script below and it will automatically install, any clutter on the Desktop will archive to folder with yesterday’s date found within the Archive folder located on the Desktop. echo "You must run this install script with super user privileges, use either sudo or become root with su -"
echo "!! Desktop Tidy successfully installed !!" echo "When you login a desktop will be created based on todays date"
echo "Should you wish to retrieve an old file, archives can be found at $archive and are named by date"
Based on ZF2 Skeleton and the Album tutorial, this ZF2 application extends this further by migrating fully to Doctrine2 and adding comments for Albums as an association. There is provision for Dynamic Modules & layouts, seperating the various layers. The default module has routing setup with a top bar navigation, along with a GUI to demonstrate an AJAX RESTful service. A RESTful service is in place, that is contained within its own module to serve the Albums and comments objects as Create, Update, Delete and List to the default application. A CMS module is in place that uses identity persistance and Zend Auth to authenticate the users, the login forms and validation are all handled. The CMS users can be created and managed, the CMS also has independent Navigation from the default route, along with CRUD services for the albums & comments services. Twitter bootstrap has been intergrated into the CMS, so Flash Messages and form validation are all displaying within a bootstrap enviroment. Public is the Document-root for the server. I am often needing to add a script to create virtual hosting, below is one I have written for fedora (that can be altered for any distro) that creates the necessary folder structure, vhost host entries and restarts Apache. I was interested in what my ethernet port was doing on my virgin media TIVO box, so I ran some tests and found I could control my TIVO box from my laptop, here are my findings. First, I went into the Tivo boxes settings on screen and enabled network access. The obvious one that stands out is port 443, so visiting https://192.168.0.7/ shows a web server requesting login, I found that the username is tivo and the password is your media key found in settings > mediakey. Once logged in, a list of recorded programmes will be displayed but however streaming and downloading are disabled :(. I tried for sometime to circumvent the streaming restriction using various techniques the closest I came was with VLC and special plugins http://tivo-vlc.sourceforge.net/notes.php#install, but so far I haven’t been able to achieve this. I looked into what the box is, and it turns out its fundamentally Linux box with a glossy coat, with some features disabled (like streaming something to do with UK copyright laws). TELEPORT <PLACE>- e.g TIVO, LIVETV, GUIDE, and NOWPLAYING. SETCH <CHANNEL> - Change channel. If the current tuner is recording a program, it will change the other tuner. If both tuners are recording, the TiVo will respond with "CH_FAILED RECORDING <Title>. Using this command while Tivo is replaying will give "CH_FAILED NO_LIVE". FORCECH <CHANNEL> - This command will force the current tuner to the tune the desired channel regardless of what it's doing. If a recording is being recorded it will cancel the recording and change the channel without confirmation. a quick google and I found the following IRCODE commands that seem to work. Typing these commands into the telnet session, made the tivo box change channel etc…. cool! So, as long as you have Python installed (Mac & linux users by default), just running the script produces a nice GUI that can manage your Tivo box from your laptop. I have written a collection of classes, that are capable of accepting a submission from a get (REST) or post (form) and output them to an email, the screen or to a database table. The class can be used to output a CSV, an email or XML (REST). The code is very straight forward for example create a form.html and add the following. Next, the listener needs to know which fields are valid fields, otherwise every bit of junk somebody sends to this script will be placed into the database, this is done in the form of an array, with the array key being the fieldname, and the value being whether or not is it required, if a field is defined as required and not codesent, the submission will fail with an error. next we have to define, what we wish to do with the submission, in this case, save it to a database, first get the database instance. 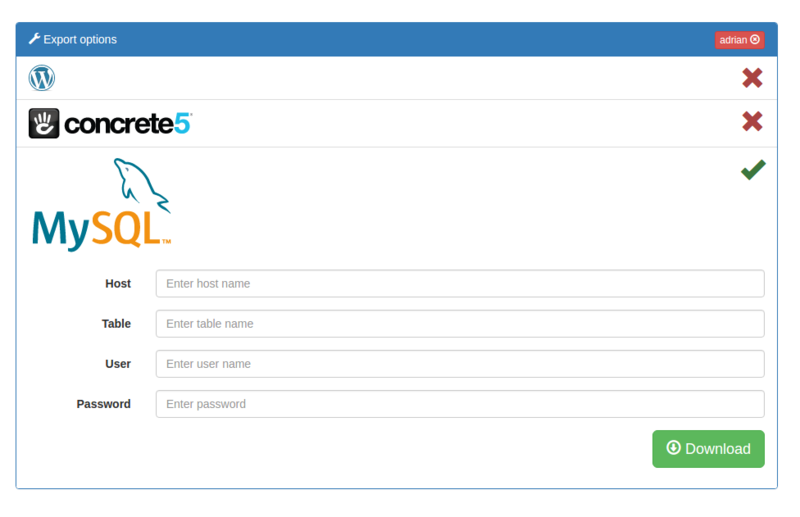 by default, the database will default to certain values, typically it will connect with the username “root”, password “”, database “data”, host “localhost”, table called “submissions” and the field “submitted”. if you need to change any of these values, it can be done by setting a config of type stdConfig with an array of new parameters. 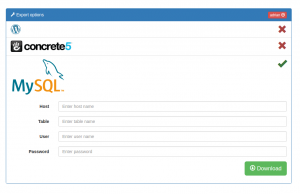 This is a very quick way to add password protection to a controller such as a cms controller. This code intercepts the login within the init() method of your chosen controller, if they are logged in they are free to go, if not they are required to login, the form is rendered and validated against the access model. The session is obfuscated to deter tampering. I had a problem with my zend application hanging with a white screen for no reason. was executed, this is just a session? so debugging further, confirmed that session_start() hangs when it used to work. I found this resolved the problem completely. I then just removed this debug-code and went back to developing my zend app. Download both ckeditor and ckfinder. Decompress them into the root directory. To add the field to the form. You also need to alter in ckfinder/userfiles/config.php the function CheckAuthentication(), to return true, take note of the warning! !